Prince Pine is the prince of Jewelry Land and the son of King Fret in Yoshi's Safari. 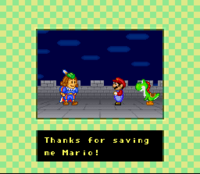 He and his father are friends with Princess Peach, and when their kingdom is attacked by Bowser, Peach sends Mario and Yoshi to help. In his attack, Bowser kidnaps Prince Pine and his father and steals the twelve magical jewels that unite Jewelry Land, splitting the kingdom in half, creating a Light Realm and a Dark Realm. King Fret was held in the Light Realm, while Prince Pine was imprisoned in the Dark Realm. After Mario and Yoshi defeat Bowser, Prince Pine is released. Pain-ōji Prince Pine. May be referring to "Pineapple" (sometimes transcribed as 「パインアップル」), similar to how Peach is named after a fruit. ↑ Ryuto138. (December 28, 2007). Playthrough of the Japanese version of Yoshi's Safari. YouTube. Retrieved July 23, 2013. This page was last edited on September 12, 2017, at 14:46.